Dentistry has come a long way since wooden dentures were used to replace George Washington’s teeth. Today, if you are missing one or more teeth, you can choose from a variety of methods to replace them, including removable appliances, fixed bridges, and implants. During your consultation, we will discuss your options with you and help you decide what's best for your needs. When it comes to replacing missing teeth, implants are a proven method that looks natural and feels secure. Often made of titanium, an implant acts like an artificial root to support a false tooth or teeth. First, we place the implant into a hole made in the jawbone. Then, we secure a post to this new "root" and use it to secure a prosthetic device, such as a crown or bridge, above the gum. We can also use implants to create a more secure and stable base for removable dentures. Implants offer many advantages over removable dentures. Because removable dentures are not permanently fixed in place, they may move around when you eat or speak. Additionally, the bone that supports the denture can change or shrink over time, making your denture increasingly uncomfortable. Implants also have advantages over fixed bridges, especially when the teeth adjacent to the missing tooth or teeth are healthy. Often to create a fixed bridge, crowns will be placed on adjacent teeth to support the replacement tooth or teeth. However, if these teeth are free from decay and existing restorations, you may prefer not to alter them. 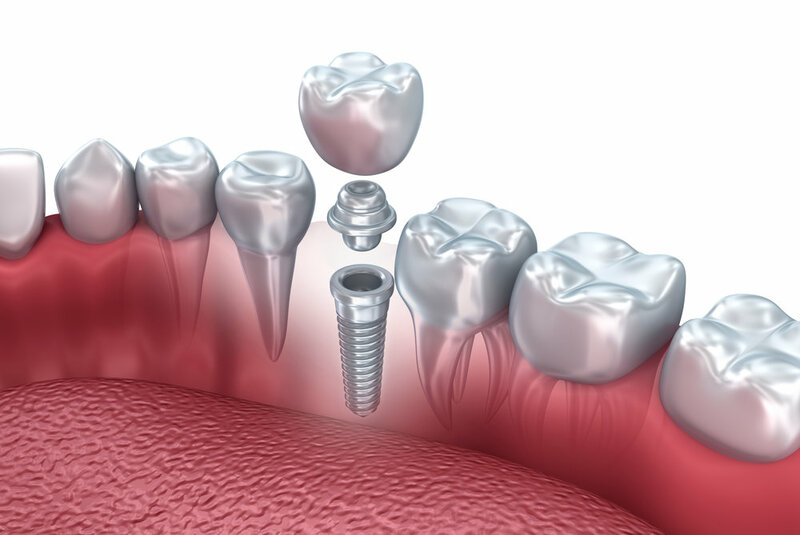 Using an implant, we can replace your missing tooth or teeth while leaving all adjacent teeth in their natural state. While implants are highly effective, the likelihood of success depends on several factors. The amount of bone available to support the implant, your health, whether you smoke, and the quality of ongoing home care all affect long-term success. Remember, replacing missing teeth is important to maintaining good dental health. We'll evaluate the conditions in your mouth to help you decide if implants are right for you.